I've always liked screens full of randomly colored pixels. They're interesting to look at and the programs that draw them are fun to watch. Fill your screen, or a graphical window, with colored pixels. Your program must have an even chance of picking all colors (i.e in the range #000000 to #FFFFFF), or all colors that can be displayed on your system. 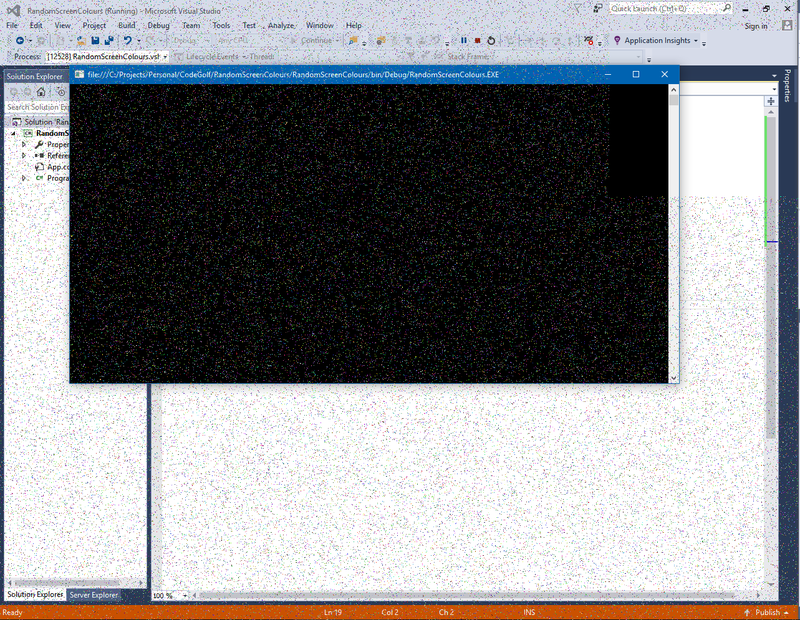 Your program must continue to display random pixels until manually stopped (it cannot terminate on its own). Pixels can be any size, as long as your output has at least 40x40 "pixels". Your program must run at such a speed that it can replace every pixel on the screen/window at least once after running for three minutes. Your program must choose truly random colors and points to replace, i.e. random with all points/colors equally likely. It cannot just look random. It must use a pRNG or better, and the output cannot be the same every time. Your program must have an equal chance of picking all colors each iteration. Your program must replace only one pixel at once. Your program cannot use the internet nor your filesystem (/dev/random and /dev/urandom excepted). The shortest answer in each language wins. Have fun! Here is a full YouTube overview, but I'll try to outline the code below. 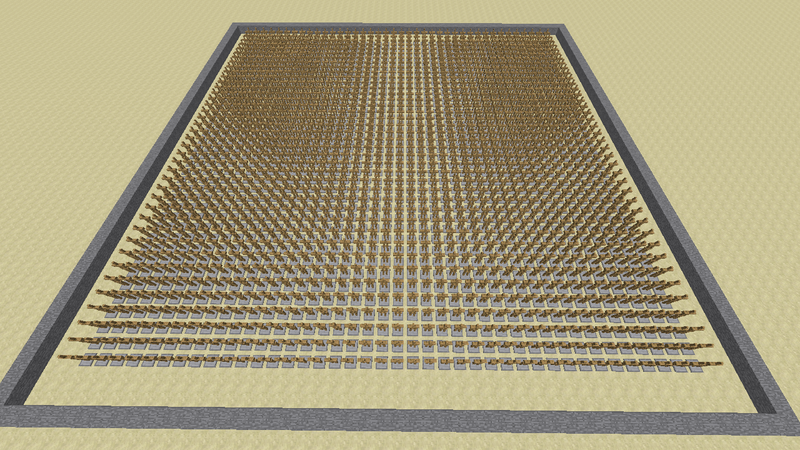 This sets up the 40x40 grid of Minecraft armor stands. Armor stands are necessary because Minecraft has no way to substitute variables into world coordinates. So the workaround is to refer to the location of these armor stand entities. That "@r" is the magic sauce, it selects a random entity in the world that matches the given conditions. 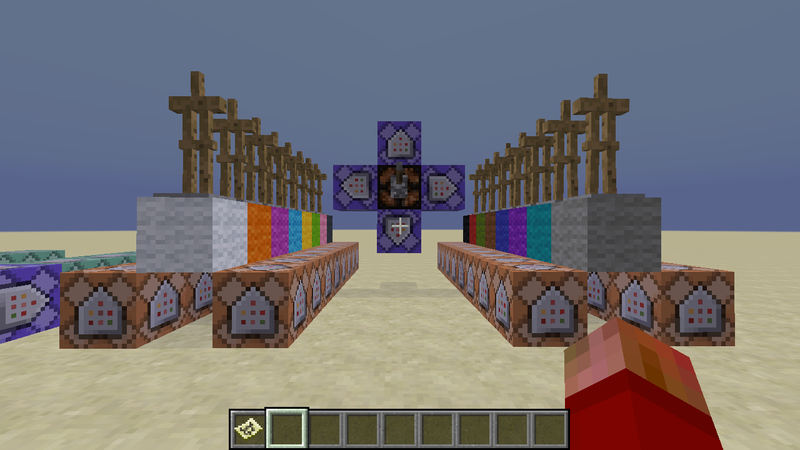 In this case, it finds an armor stand inside a radius of 9 blocks, and we've set up 16 armor stands, one for each wool color. 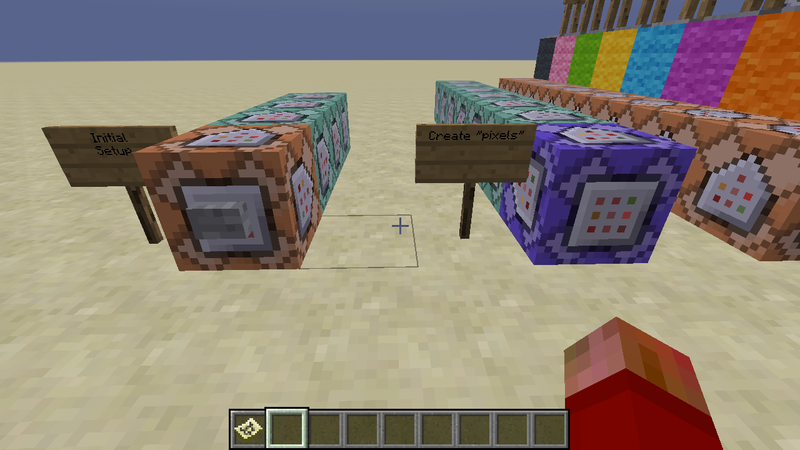 Under the selected color, it places a redstone block (which powers the two command blocks on either side). This first line uses our same magic @r command to choose any armor stand on the entire map (no radius restriction, so that includes the 40x40 grid), and places a wool of the selected color above its head. The X determines the color, and ranges from 0 to 15. The second command removes the redstone block so it is ready to go again. I have 5 purple repeater blocks, and redstone works in "ticks" 20 times a second, so I'm placing 100 pixels per second (minus some color overlaps). I've timed it, and I usually get the entire grid covered in about 3 minutes. This was fun, I'll try to look for other challenges that might also work in Minecraft. Huge thanks to lorgon111 for his YouTube Command Block tutorial series. Scooted things in a bit (in all 3 dimensions) so I could reduce the overall size of the saved area. Changed the different colored wools to stone, they were just decorative anyway. Changed all air blocks to void blocks (the red squares). Tested by pulling the saved structure into a new world, everything still works as designed. In Minecraft 1.12, create a new creative superflat world using the "Redstone Ready" preset. Make it peaceful mode. Once the world exists, copy the NBT file into a new \structures folder you create under the current world save. Back in the game, do /give @p structure_block, and /tp @p -12, 56, -22 to jump to the right spot to get started. Dig a hole and place the structure block at -12, 55, -22. Right-click the structure block, click the mode button to switch it to "Load". Type in "random_pixels", turn "include entities" ON, and click "Load"
If it finds the structure file, it will preview the outline. Right-click again and click "load" to bring the structure into the world. Press the button to run the setup routine. 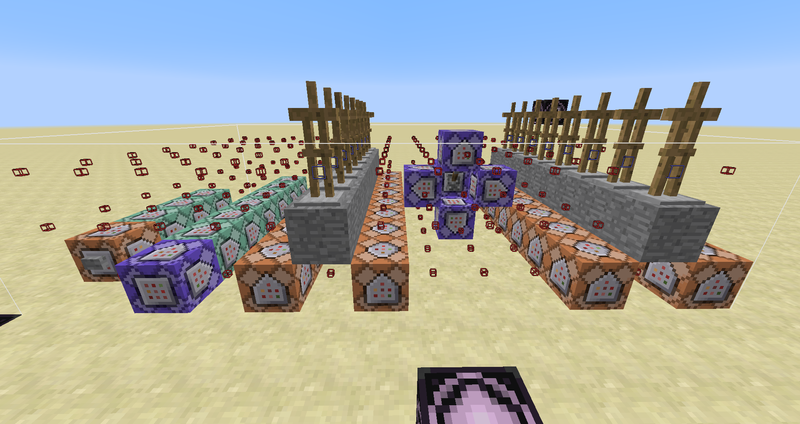 When it completes, flip the switch to run the wool randomization. Sadly the pix_fmt is required, as ffmpeg defaults to yuv420p. That fails the "must have equal likelihood of every possible pixel color" requirement. Conveniently, cif is a shortcut for a fairly large video size that uses less space than "40x40". 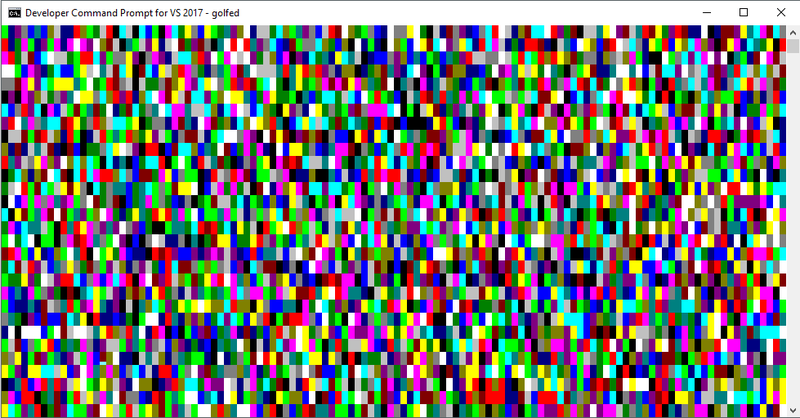 Unsurprisingly, optimizing this gif with gifsicle did absolutely nothing. It's 4MiB. This chooses between 16 colors (dark grey, red, green, blue, orange, cyan, purple, light grey, black, pink, light blue, yellow, light cyan, magenta, white) and prints them directly to the terminal. Note that if your GPU is too slow, this may seem like it's updating the entire screen at once. It's actually going pixel by pixel, but C is fast. Thanks to Luke and other commenters for saving me lots of bytes. Try it at MATL Online. I have added a half-second pause (.5Y.) to this version. The TI-83 family calculators with color screens (TI 84+CE and CSE) support 15 colors. They have color codes 10 through 24. 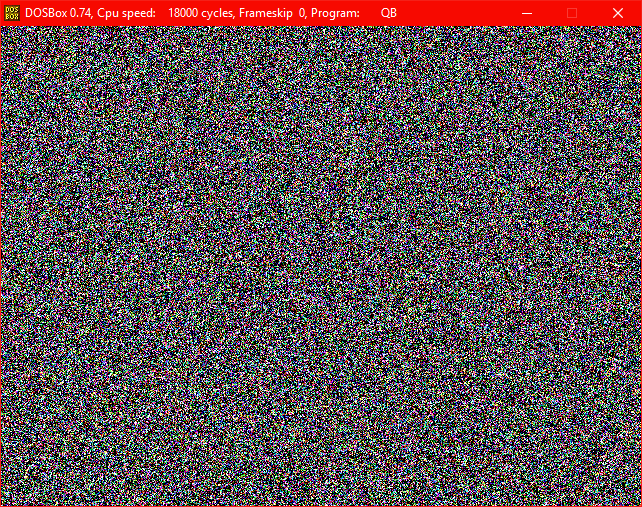 This cycles through all the pixels in a 120 by 120 (5!) 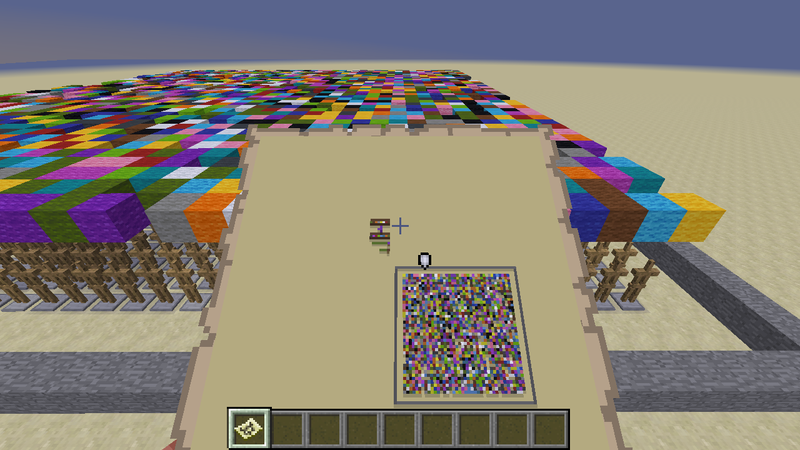 square and assigns each a random color. \e[48;5;COLORm is the escape secuence to background color. Each "pixel" has the chance to be in the [0..16777215] range every time. The canvas element is 300x150 by default, but I'm actually drawing on a 255x255 square, so there are off canvas pixels, so the effective area is 255x150. Works only on Google Chrome. Output looks like the image below. One "pixel" changes at a time, and only one of the RGB-colors changes. Why? The colors in MATLAB are represented as a 3D-matrix, one layer for R,G and B. The code above changes only one of the layers per iteration. All pixels and all layers can be changed, so if you wait a bit all colors are equally possible in all positions. Add pause(t) inside the loop to pause t seconds between each image. You must stop it with Ctrl+C. Anonymous VBE immediate window function that uses a helper function (see below) to output an array of randomly colored cells to the range A1:AN40 of the activesheet object. Saved 88 bytes thanks to @CodyGray. A full program that get's the handle to the screen and it's size and then starts randomly drawing pixels on it. Note that this might grind your graphics card to a halt when ran. Also if the screen or any control decides to repaint at any time the pixels will be lost and have to be redrawn. Note: When running keep focus on the window as to kill it you have to either Alt+F4 or press the close button and doing so when you can't see the screen is a bit hard. I couldn't record this working, with ScreenToGif, as that kept forcing a repaint so the pixels would get removed. However, here is a screenshot of it running after about 10-15 seconds, any longer and I think I may have ground my PC to a halt! The gap in the top right corner is where the screen forced a repaint just as I took the screenshot. Uses "all" (windows) 16 console colors. Thanks for the "feature" to be able to alias classes in C# via the using directive. Ideally I could use a pixel index instead of x,y location, but Processing's pixels access requires loadPixels() pre and updatePixels() post, hence the use of set(). point() would work too, but has more chars and requires stroke(). 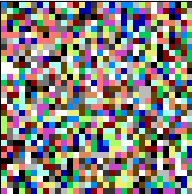 The random area is actually 99x99 to save a few bytes(instead of 100x100), but that should cover 40x40 with each pixel in such an area to be replaced. Perlin noise() is is used instead of random() to keep it more pseudo-random and a byte shorter. 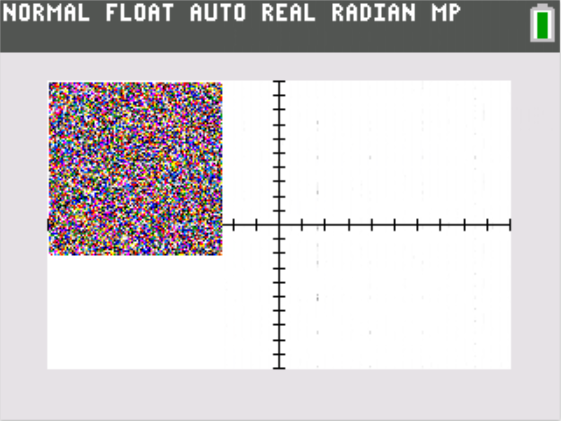 The value is computed once, but used twice: once for the random position, then again for the colour. The colour is actually ARGB(00000000 to FFFFFFFF) (not RGB) (bonus points ? :D). I'm not quite sure if this fits the specs, because it's on a canvas in a 40x40 area. I can't guarantee that every pixel is replaced every 3 minutes, but looking at it it appears to be doing so. At least the odds of it missing a pixel, out of 1600 total, updating a random one 30x per second, totaling 5400 updates per 3 minutes, makes it unlikely that one would be missed. The program is really straightforward. 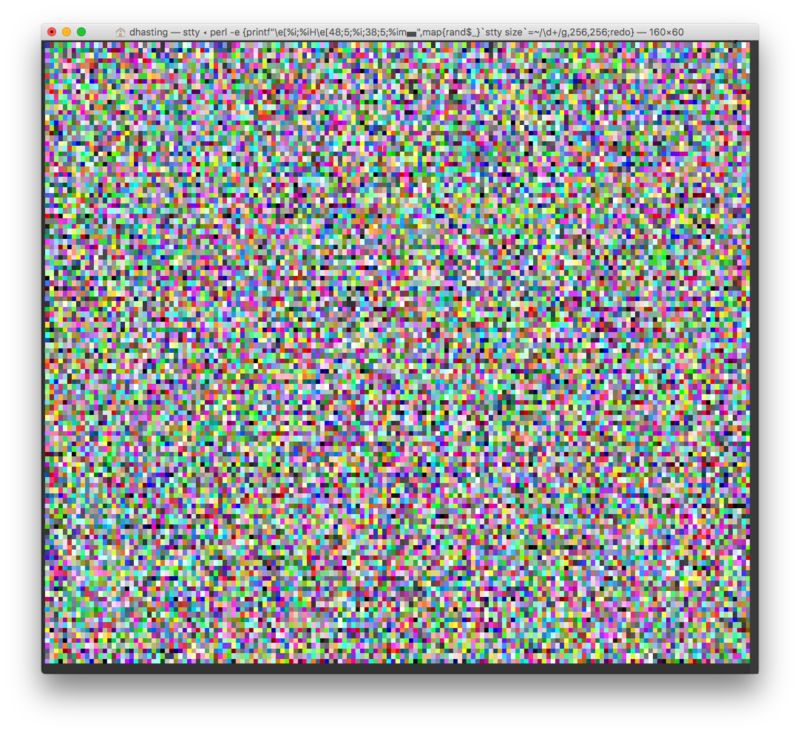 Open a window at 40x40 pixels, and every frame (default 30 per second) get a random color, and draw a point at a random coordinate between 0 and the parameter. 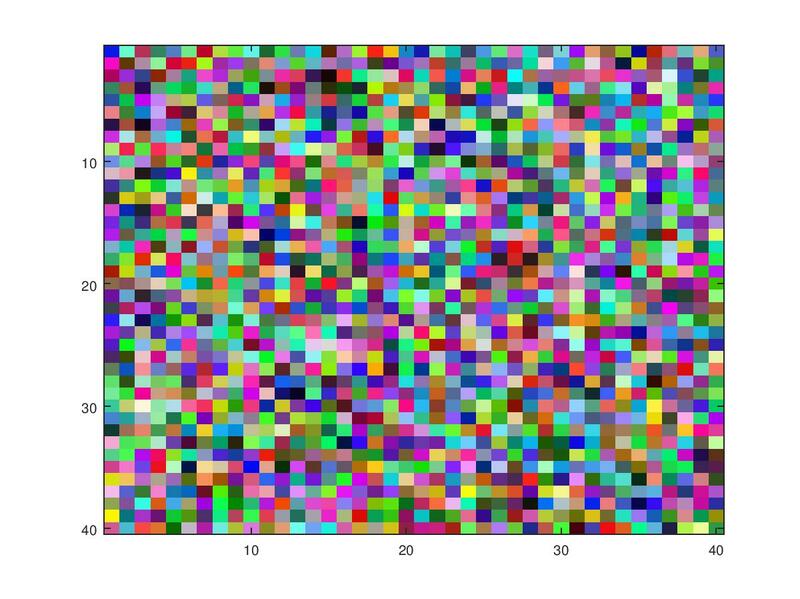 40 for pixel coordinates, 255 for colors. Newlines necessary and included in byte count. SVG version, heavily inspired by @Octopus's <canvas> approach. Since the Stack Snippet likes to break the script by parsing the <rect> tag, here's a CodePen. The only language that I know of, being not esoteric/specially designed for codegolfing, and have forever function. Any idea on the map part? No TIO link because you obviously can't print to the kind of terminal this requires online. The \x1bs are literal escape characters. Relies on stty command and works well on OS X. Similar to other approaches, but I liked the combination of all params into one call to printf so thought I'd share. Kills my terminal. This approach uses a unicode block ▄ and a random foreground and background colour which gives a more square pixel. Kills my terminal too, but looks cooler. The \es are literal escape characters. These are pretty much translations of my Perl submission, but using bash fork bomb style syntax! Not as clever as the other bash entry that writes directly to the display I'm afraid. Same as my Perl answer, this uses a unicode character for the foreground and colours the background of each pixel too. Unfortunately, QBIC doesn't set a SCREEN mode by default, so that eats some bytes. PSET is an illegal command in QBIC's default graphical context. @Anonymous found an error in QBIC's rnd() function. Fixing that gives the output below. Thanks! Whew, this was fun. Does more or less the same thing as my Applesoft BASIC solution. 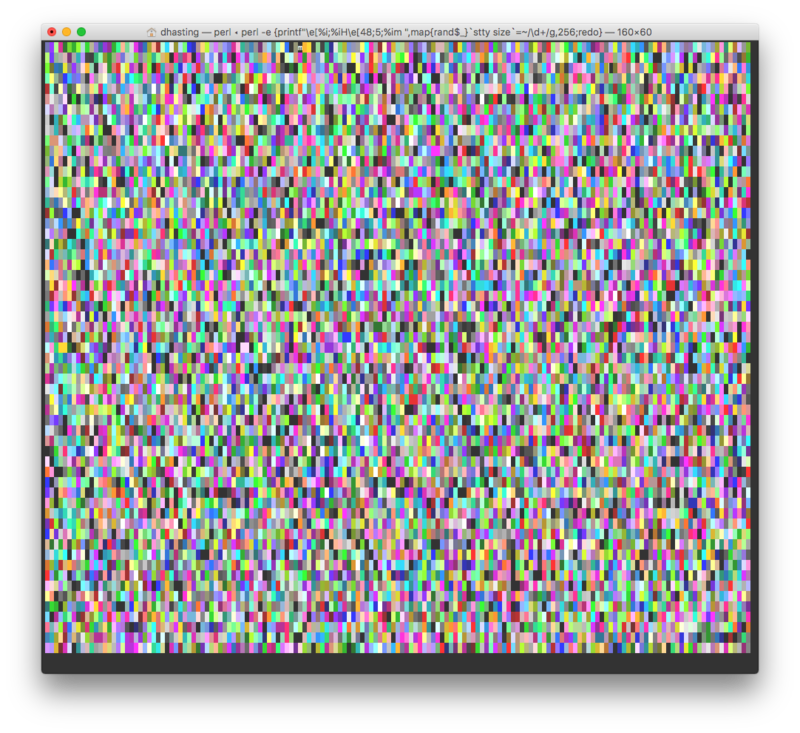 image makes the required 40x40 grid of rectangles with a matrix m of values (fixed to be 1:1600 in a 40x40 square), with a randomly selected color for each rectangle, k. It plots the image, waits long enough to actually render the image, then randomly changes one of the colors. 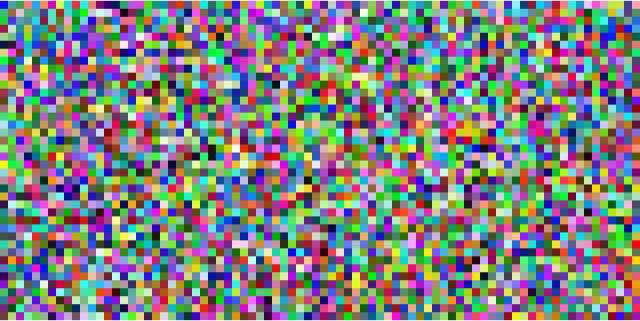 Uses hsv encoding since it is a value between 0 and 1, which allows us to use runif to generate random colors. This generates a new plot each time. Very straightforward, uses Dynamic around an ArrayPlot. Not terribly fast; limited by the maximum speed dynamic can update, but should fulfill the goal on most computers. 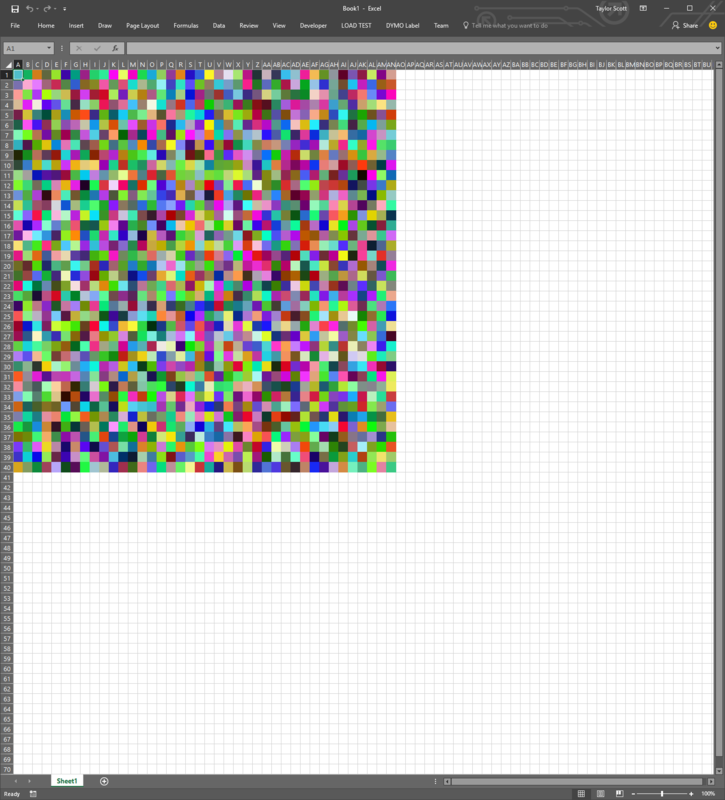 Starts out with a random 40x40 grid and recolors a random pixel one at a time. Ceiling characters are 3 bytes each, Ouch! Not the answer you're looking for? Browse other questions tagged code-golf graphical-output random color or ask your own question.